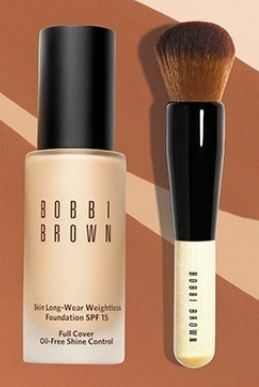 Purchase a Skin Long-Wear Weightless Foundation to receive 10% off + complimentary full coverage brush and $30 Bobbi Brown gift voucher. Key in promocode BBFDT10 at checkout. Terms & conditions apply, while stocks last. All the benefits of our cult-favorite Extra Repair Moisturizing Balm—now in a lightweight yet luxurious cream (perfect for layering and prepping skin for seamless foundation application). This skin-nourishing formula utilizes a unique Triple Emulsion Technology to give the cream its lightweight texture while still allowing it to be incredibly moisturizing. Made with omega-rich sunflower oil—an ingredient packed with essential fatty acids—to provide moisturization without a heavy feel. Glycerin and Sodium Hyaluronate plump and smooth the appearance of fine, dry lines, while Shea Butter provides a protective barrier against moisture loss. Skin looks fresher, smoother, firmer—for a healthier-looking appearance over time.